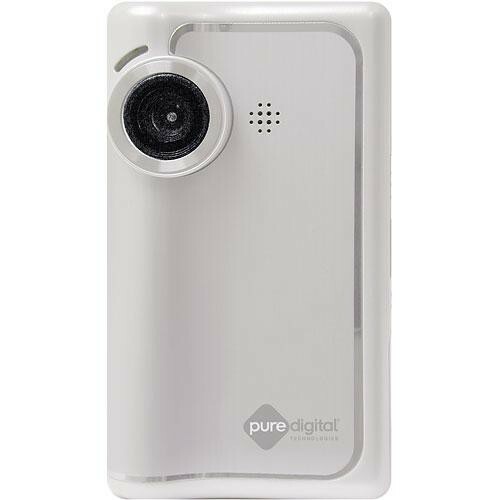 The Pure Digital 30 Minute Point & Shoot Camcorder is so easy to use, anyone can record home videos. All you have to do is point the camera at your subject, press record and shoot. That's it! Capture up to 30 minutes of video to the camera's internal 512MB flash memory and when you're ready to share what you've recorded upload it to your compatible PC or Mac via the USB arm. This camera also features a 2x digital zoom for getting in closer, a 1.4" TFT color playback screen, and review and delete options for recorded footage. Built-in software aids in sharing and archiving, and includes free video hosting options. This camcorder is not only easy to use but also extremely affordable, which makes it perfect for the budget conscious consumer who wants an uncomplicated camcorder experience. No menus to worry about, no complicated steps to remember: just point and shoot!